You can cleanly break this album into two halves, and, in fact, the first half was initially released alone. Part one is mostly versions of traditional Christmas music, and part two is music from the 2016 holiday episode. There's one track that straddles the divide, but we'll get there. Let's remember one thing up front: ponies do not celebrate Christmas. They celebrate Hearth's Warming. (In fact, the composer clarified this point on his Facebook page.) So it's a little odd to listen to pony voice actresses singing about Christmas. However, these are some of the sweetest, most fun Christmas songs I've heard in a while, so I'll easily let that go. Many of them are unique or special rewrites of classic Christmas tunes. They aren't written to be Hearth's Warming songs, but they are otherwise completely tweaked to fit the characters and the world. Each solo song is well-chosen for the character, and the imagery is strong enough that I can easily picture the animation that would go with it. 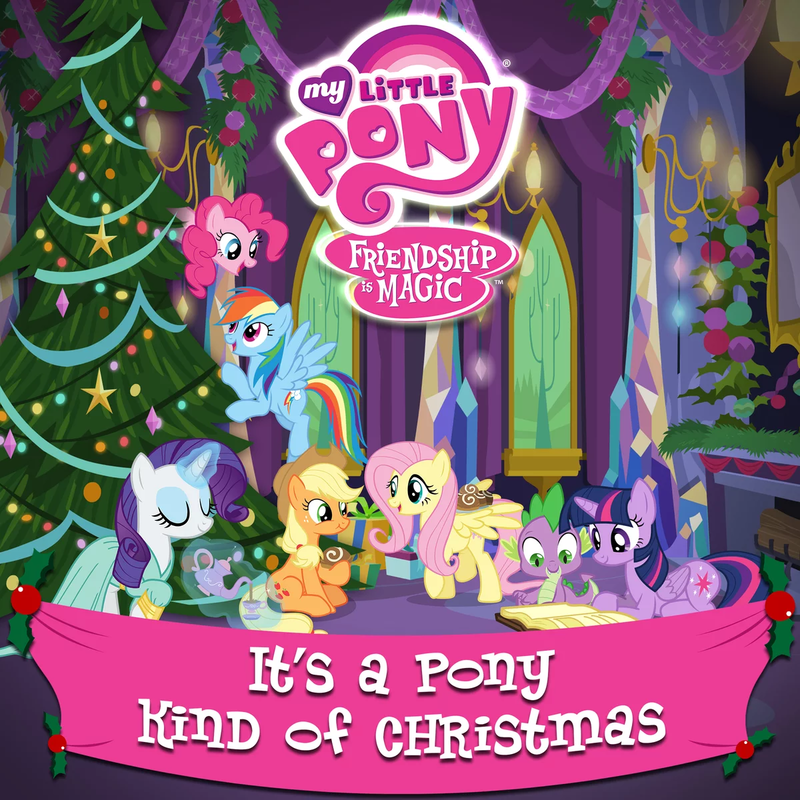 It's a Pony Kind of Christmas is an original track for this album. One of the things I liked the most was that there are lines in this group song foreshadowing almost all of the solo songs later. The most obvious one is the line from Jingle Bells, but the others are alluded to as well. It really helps the songs hang together as a unit. Okay, I LOVE this version. Uptempo and brash, nobody dashes through the snow like Rainbow Dash. Rarity sings this classed-up arrangement, and it's quite lovely. This is one of the most changed songs, as it intercuts the traditional chorus with Twilight Sparkle singing about preparing for the holiday. I think this is cute today, but I would have gone nuts for Fluttershy's wildlife-centered version of this song when I was young. Pinkie Pie takes this one, and it's decent, but there are a lot of decent versions of this song, so it's less special than the other tracks. This is a bit of an oddball. It's an original song for the album, and it's sung by a young male character who has not been in anything else. The song's good, but it's just an odd choice. Spike doo-wops his way through a jazzy version of this song. Wow. Just... this is beautiful. It's a perfect choice for the Apple family to sing, and it's a fantastic set of new lyrics that maintain the sense of the original incredibly well. Here's the turning point! The Heart Carol is from the first Hearth's Warming episode, but this is an extended version which makes it more satisfying. are all from "A Hearth’s Warming Eve Tail," as previously mentioned. Listening to them alone, I still really like them. I like the bouncy opening number; I like the lurching echoes of songs like Kidnap the Sandy Claws in Say Goodbye to the Holiday. However, the episode ends with a reprise of Hearth's Warming Eve Is Here Once Again. It's really odd to just end the album on Luna's Future. That song is about how the future is doomed to cold and darkness! If you're listening with little kids, maybe treat the two halves of the album separately, or listen to it on a loop so you head straight back to the start. Despite that caveat, if you and/or your kids are a fan of the show, you should definitely consider picking up this album.